What has happened to this CRT display? What class of software was created to resolve this problem? The screen is burnt. Screen savers were introduced to fix this problem. Screen burn or ghost image. Screensavers were created to deal with this problem. Burn-in or afterimage. And that’s why screensavers were made. A condition called “Burn-in” or burnt phosphor. Screensavers were created to combat it and still do on plasma screens. 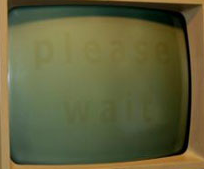 Screen burn in old CRT monitors when display is unchanged for a long time. Screen savers were created to avoid this. Nice question.